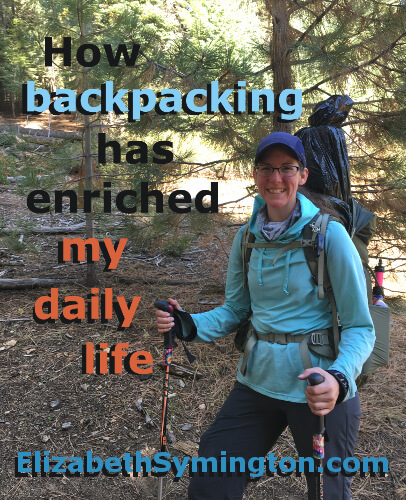 This is Day 25 of the 31 day series on “How backpacking has enriched my daily life.” I expected lightweight backpacking to be a hobby. Instead it has transformed me for the better. Backpacking in Yosemite, as well as living and working in that National Park made me inquisitive about the plants and animals around me, as well as the best hiking trails. When my friends and family visited me, I was super excited to show them all about my beloved Yosemite. My first guest flew up from New Zealand. We had a lot of fun hiking around Nevada Falls and Tuolumne Grove of Giant Sequoias. 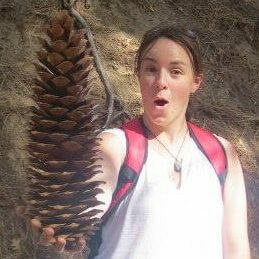 Janine was so impressed when she saw her first giant Sugar Pine cone that two years later it is still her Facebook profile photo! I’m so proud of the fact that Yosemite has the largest known tree of its species in the USA for the California white Fir, California red Fir, Western white Pine, and the Jeffrey pine! You can nominate a champion tree and check out other winning trees over at American Forest. I was lucky enough to have my mom visit me multiple times! We went on a lot of day hikes and Ranger programs. 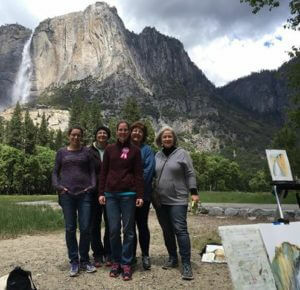 The highlight was taking an art class with my mom where we painted Yosemite Falls. To my surprise, that was the first art class my mom had ever taken. She loved it so much that she took up painting as a hobby! I loved it when friends would visit from Sacramento and the San Francisco Bay Area. 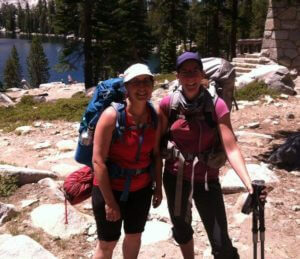 One memorable hike was when Amy and I went backpacking to Ostrander Lake. After we set up camp right on the lake, we heard a big tree fall in the distance! A few days later, Amy was really brave and went on her first solo backpack (I had to work) and she had a good time. After those trips we both switched to lighter backpacking gear. I was thrilled to pieces when more of my family visited me. We got to create special memories by celebrating Thanksgiving and New Years in Yosemite. I loved it when we went snowshoeing with a Ranger naturalist who taught us about how animals survive in the snow. 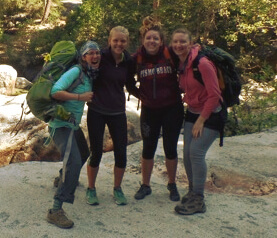 And another highlight was when Sarah and I got to take my cousin Sam and her best friend Izzy on their first backpacking trip! Getting to show off my beloved Park to my friends and family are some of my fondest memories of living in Yosemite. Thank you for visiting me! Visiting You in Yosemite was a highlight of my vacations. It was a treat to get to know this landmark park. Thank you for braving the snow to visit me (and the traffic, road construction, ect.) I loved spending time with you in Yosemite.